For coffeeholics who use a Keurig or Mixpresso, the dilemma over where to store their pile of K-cups are for real. Those little cups with different flavors to enjoy look cute and seem like a fun way to have your morning coffee fix but not until you realize there are already hundreds of them colonizing your kitchen counter. The problem then becomes apparent: how to store these K-cups without having to give up on a pre-caffeinated life? You’re in luck ‘cos we’ve rounded up the many ways you can reclaim your kitchen counter and store those cute little K-cups with a piece of heaven inside each one of them. 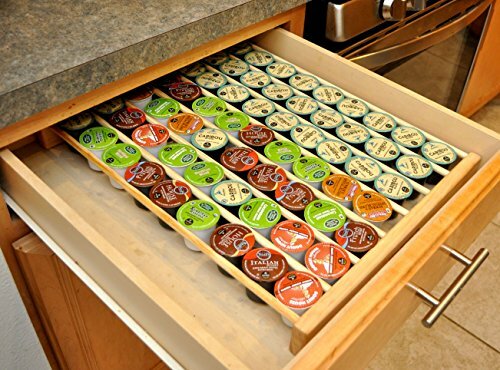 One of the most popular ways to store K-cups, drawers also provide a place where you can set your coffee brewer. This allows users to keep all of their coffee pods near the brewer so that getting a cup of coffee early in the morning is as easy as possible. Drawers make it very easy to look through your collection of K-cups and find the one that you want to make without having to dig through a jumble of cups. Staying organized is key, and this drawer makes that very easy. Having a large enough drawer also means that you can place your brewer on top of the drawer towards the front so that it can easily fit on top of the drawer even if the cabinet would otherwise be too low. Perfect for people who have a small kitchen and need to make sure that they are utilizing all of the space in the best way possible, this storage option allows you to keep your K-cups out of the way underneath a cabinet until you want a cup of coffee. The rack easily attaches to the bottom of your kitchen cabinet and folds down in the front or slides straight out when you want to get out a cup or refill the storage. Having your K-cups available but keeping them off of the counter saves space and ensures that your collection doesn’t get in the way. With this storage, you are only limited by how many upper cabinets you have in your kitchen, as you can easily install this rack on any cabinet that you choose. Although they take up a little more counter space than other storage options, a carousel offers a great way to keep all of your K-cups in one location, allowing you to easily decide what you want to drink. In this storage option, K-cups are stored vertically around a spinning carousel, which not only keeps them organized and makes it easier to choose which one you want to drink but also displays your fun collection. A simple spin of the top of the carousel turns the whole storage unit so that you can decide what you want to drink without much effort. While some carousels are a little larger than others, you will want to make sure that the whole unit will fit under your upper cabinets, so watch the overall height. Most carousels have individual spots for the K-cups so you can choose one from any part of the carousel, while others utilize a drop-down system where you insert the K-cups at the top and they drop down to an opening at the bottom where you can easily remove them. Display racks come in many different sizes and are made from many different materials, which makes it incredibly easy and fun to find one that will work with the décor and appearance of your kitchen. 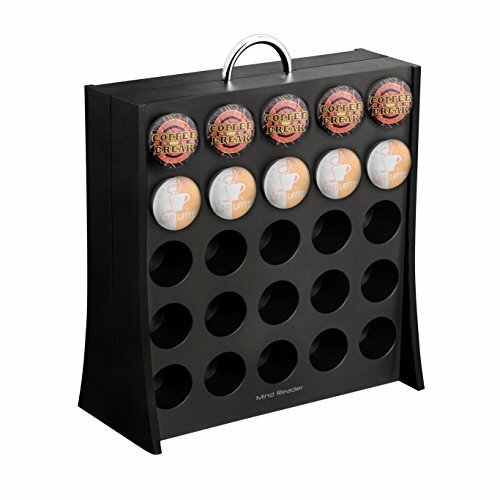 When shopping for a display rack, you will want to make sure that it has enough room to store multiple K-cups so that you do not have to constantly refill your K-cups every few days. Display racks are a great way to showcase a number of different flavors and they make it very easy to choose the one that you want to drink. 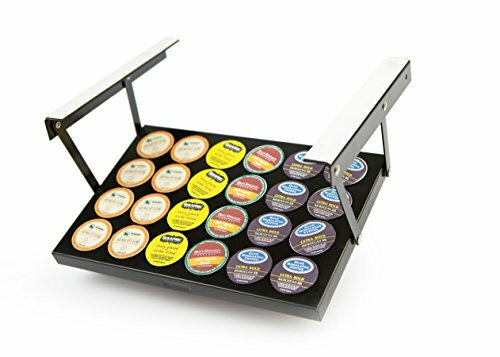 Most display racks have a slight tilt to them to keep the K-cups from sliding out and to showcase their front so that you can find the one that you want to enjoy. If you have a large family or love collecting and using K-cups, then you will need to opt for a storage option that can easily hold multiple K-cups. One of the best options if you find yourself in this situation is buying a drawer organizer. Instead of relying on only one drawer full of K-cups, these organizers actually stack multiple drawers on top of each other so that you have plenty of storage in your kitchen. While a drawer organizer will be tall enough that you can’t easily store your brewer on top, the top of the organizer is ideal for placing a few coffee cups so that they are within reach when you are ready to brew. Keep your K-cups up and out of the way but still handy and easy to reach with storage that you can mount either on your fridge or on a wall. This is an amazing space-saver and has the added benefit of not taking up any room in your kitchen drawers. These dispensers are very easy to mount and will either be screwed into the wall or come with very strong magnets so that they can attach to the fridge without any worry about the dispenser sliding down or losing the K-cups. The system for these is simple: the user drops the K-cups into the top of the dispenser and they slide down, with the lid facing outward for easy selection, to rest in a stack. With a few different stacks of K-cups, you can keep your favorite styles easily separated. Then, when you want a drink, simply remove a K-cup from the bottom and the whole line will slide down for the next time you want to make a cup of coffee. Baskets are a very fun and carefree way to store your K-cups, but because they end up with the collection of K-cups being a bit jumbled, they aren’t the best option for people who prefer order in their kitchen. When you opt to use a basket for your K-cup storage, you will simply toss all of your K-cups into the basket. While this does make it very easy to reach in and grab a K-cup when you are ready to brew a cup of coffee, if you like being able to easily see all of your options at once, it can get a little frustrating. For that reason, this storage option is generally best for people who only like one or two kinds of K-cups, as it’s easy to sort through the basket for those options, or for people who don’t mind being surprised. Grabbing the first K-cup that comes to your hand is a fun way to enjoy a drink, but not everyone wants to give up that control. 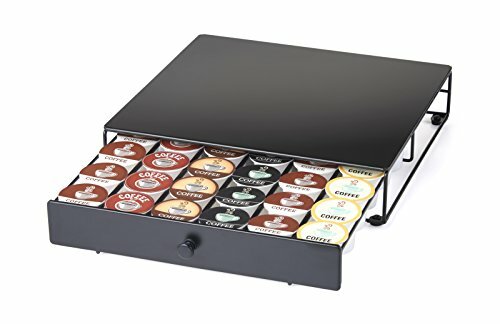 If you want to keep your K-cups organized but don’t have a lot of space on your countertop to devote to storage, a drawer organizer may be the best option for you. They fit neatly into an empty drawer in your kitchen and ensure that your K-cups don’t become a jumbled mess. When you want a cup of coffee, you simply have to pull out the drawer and select the type of K-cup that sounds best. While some people aren’t terribly keen on giving up a drawer in their kitchen for K-cup storage, others recognize the benefits of having the K-cups off of their countertops and love this kind of storage. You do want your drawer storage to be attractive, but the overall appearance isn’t as important as it is when the storage will be on display in the kitchen, as guests will generally not see this type of K-cup storage. The top of the drawer storage that actually holds the K-cups will often slide back, providing you with even more storage room. While you can’t store another layer of K-cups here, this is a great place to stash tea bags, spoons, packets of sugar, and even hot chocolate, making this drawer a one-stop-shop for all kinds of hot drinks. This storage option is very attractive and showcases the types of K-cups that you have, making it very easy to see your options and choose which one you want to drink next. Caddies sit up on the counter in your kitchen and are generally smaller than display racks, so you will not have nearly as many K-cups out on display. While this will limit the number of drinks that you can make before you have to refill the caddy, many people prefer this because it results in a cleaner and less-cluttered appearance in the kitchen. When choosing an easel caddy, make sure that the material and the color of the caddy work with the rest of your kitchen decor, as it will be on display and the appearance of the caddy will have a direct impact on how your kitchen looks. For see-through storage that makes it easy to pick a K-cup and tell when you are running low, you’ll want to opt for plastic. While most people think of plastic as being relatively flimsy, K-cup storage is made from a higher-quality plastic that is strong and has been built to last. This means that you won’t have to worry about the plastic cracking or splintering if you drop something on the storage unit. Plastic is also very easy to wipe clean, which is important because spilled coffee can get everywhere. A damp cloth is all that it takes to wipe drops of coffee or other bits of kitchen detritus off of the storage unit and keep it looking its best. Metal K-cup storage generally has a very chic and industrial feel and makes your home feel like a real coffee house. Additionally, metal is very strong and can withstand the impact of being dropped. Since there is no chance of the metal molding, and as long as it is high-quality or treated it won’t rust, you don’t have to worry about the appearance of your K-cup storage. What you see is what you get with metal, and while some people have taken to using spray paint to change the color of their metal K-cup storage, the black or silver color that you can choose from generally looks great in any home. Wood is a great option for K-cup storage if you want something that is sturdy and can be updated if you so desire. Because wood can easily be stained or painted, you can ensure that your K-cup storage unit matches the décor of your kitchen, no matter how many times your tastes change. Wooden K-cup storage is generally built to last, and as long as it has been properly treated, you will not need to worry about mold growing on your unit. For a lighter material than wood and one that does a great job standing up to the humidity of the kitchen without becoming damaged, bamboo is your best choice. It’s easy to find K-cup storage made of bamboo, partly because it is a relatively inexpensive material to work with, and partly because it will last for a very long time without needing any additional care. There’s no reason why you can’t have K-cup storage that’s personalized, and this is a great way to either make your kitchen your own or give someone a gift that they will love. While K-cup storage is always a welcome gift for any coffee lover, if you want to take it one step further, getting the storage unit personalized with their name or favorite saying will ensure that they love the gift. This is a great way to start your day off with your favorite quote or to prepare yourself for a big day. There’s no reason why you shouldn’t be able to keep all of your packets of sugar or tea bags in the same location as your K-cups, and some K-cup storage units make this very easy. Instead of devoting more countertop space to storing these additional items, you can easily store them in a K-cup holder that has space for them. Look for a unit that has individual compartments, as you will be able to separate out the types of tea that you have for easy selection.